The secret to Sony's success in Japan is summed up in two words: "Monster" and "hunter". The series has sold millions of PSP copies and millions of PSPs. It looks set to do the same thing. This time, MH won't only be doing that Sony's handheld portable, but for the Nintendo 3DS. Since launch, gamers have been down on the Nintendo 3DS's games, or lack thereof. Today in Tokyo, Nintendo went though a healthy line-up of revealed titles like Kid Icarus: Uprising and teased new ones like Mario Tennis. During the build up to today's event, it was expected that Nintendo would show of its second circle add-on, which was revealed recently in a Japanese gaming magazine. Nintendo did not. 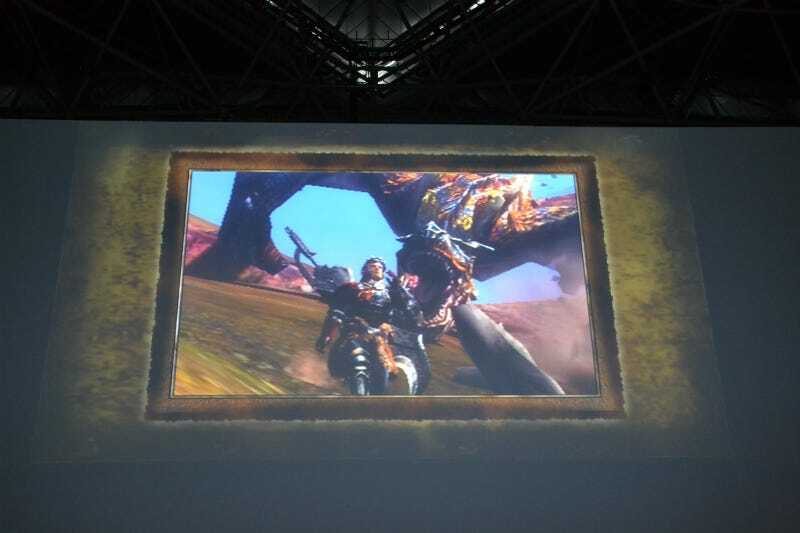 Even when when Monster Hunter 3 G's producer took the stage, Nintendo did not show the tacked on circular slide pad. Perhaps it the universally bad reaction the add-on circle pad got that might have made Nintendo decide not to show the add-on circle pad. There is something going on with that pad. Monster Hunter 3 G uses it, and Metal Gear Solid 3D: Snake Eater developer Kojima Productions received one. Kid Icarus: Uprising was delayed, leading to speculation that the game is being retrofitted for the second circle pad. The second circle pad chatter became utterly irrelevant in Japan by the end of the press conference when Nintendo revealed that Monster Hunter 4 was in development—for the 3DS. Monster Hunter is not nearly as popular in the West as in Japan, but for Japanese gamers, an announcement like this will have them second guessing any decisions to buy the PS Vita over the 3DS. Nintendo just turned this into a good old fashioned hardware war. Tomorrow, Sony is holding its press conference, and it better have some aces up its sleeve. Nintendo just went for the jugular.